Find the features and design you are looking for in the 990D! 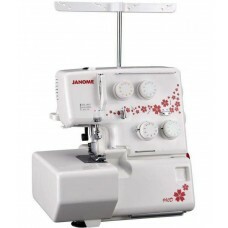 This 3, 4 thread serger offers a wide variety of function, including color coded thread guides, easily accessible lower looper, and quick change rolled hem. And its gorgeous cherry blossom design will fit perfectly in your creative space! By rotating the thread guide, the lower looper thread guides will become accessible to make threading easier. The lower looper thread guide will return to its original position automatically by turning the handwheel. Piping Foot - 1/8" and 3/16"